All notable user-facing changes to webknossos are documented in this file. The format is based on Keep a Changelog and this project adheres to Calendar Versioning 0Y.0M.MICRO. For upgrade instructions, please check the migration guide. The HTML template now includes SEO tags for demo instances and hides internal instances from search engines. Please see the migration guide on how to add publications. Fixed a permission issue in the try setup. The info tab in tracing views now displays the extent of the current dataset. #3371. The dashboard gallery loads faster #3036 and tracings in the dashboard can show their descriptions #3035. Managing new users got easier through "new inactive users" notifications #2994, and also team managers can activate them now #3050. Improved the UI for sharing datasets and tracings #3029. The tracing view got a progress-indicator #2935 and scale-bars #3049. 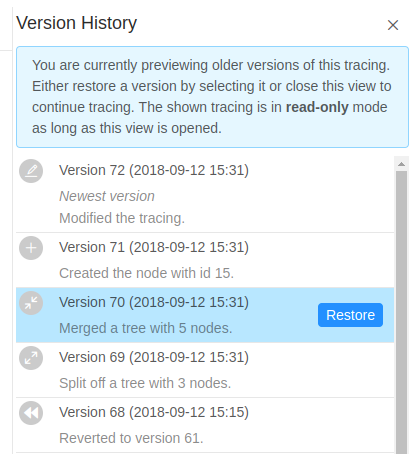 When merging datasets within a tracing via the merge-modal, the user can choose whether the merge should be executed directly in the currently opened tracing. Alternatively, a new annotation can be created which is accessible via the dashboard, as before #2935. When merging datasets within a tracing via the merge-modal, the user can choose whether the merge should be executed directly in the currently opened tracing. Alternatively, a new annotation can be created which is accessible via the dashboard (as it has been before). Added shortcuts for moving along the current tracing direction in orthogonal mode. Pressing 'e' (and 'r' for the reverse direction) will move along the "current direction", which is defined by the vector between the last two created nodes. When a lot of changes need to be persisted to the server (e.g., after importing a large NML), the save button will show a percentage-based progress indicator.